Comments for Sangamo wall clock running fast. Sangamo electrically wound clocks have a mainspring wound by an electric motor so if the power fail (very common in the 1920's) the clock will continue to run for up to 24 hours. There is a "brake" system that keeps the motor from overwinding the mainspring. If the brake wears it allows the motor to overwind the mainspring, overbanking the platform and causing the clock to run too fast. If proper cleaning and demag of the hairspring doesn't fix your problem, the brake is likly your culprit. See www.SangamoClocks.com for repair information. 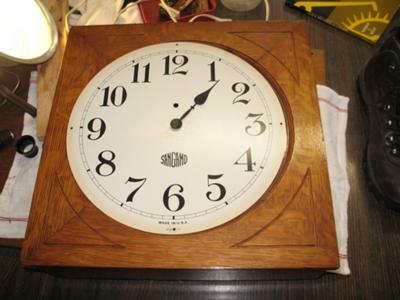 If your clock need to be cleaned and oiled, this would cause the balance wheel to have a very small rotating arc, which will cause it to run fast. Another common reason for the clock to run fast is if two, or more coils of the hairspring touch each other it effectively shortens the length of the spring and caused the clock to run fast.